Yay! 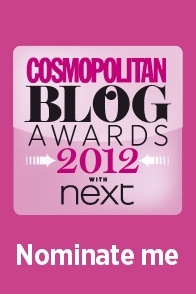 'Wear Is It From' has been nominated for the Cosmo Blog Awards 2012 and I’d hugely massively appreciate if you could vote!! The entry category I’m in is ‘Best New Fashion Blog’ and my blog has been running for less than a year. If you click on the link below, you can fill in a short form to nominate. If you love 'Wear Is It From' then please do nominate as the more nominations I get, the more chance I have of making the shortlist. Voting closes on the 30th June so get voting pretty pretty please. And tell your friends. And get your friends to tell their friends. Tell everyone yeh?? You catch my drift? ?